ROLLING STONES 1st LP 1964 '2.52' 1st Press! 1A/1A!! EARLIEST EVER!!!! On offer here is one of the RAREST LPs you will EVER see (especially in this condition!!!!) by The Rolling Stones called "The Rolling Stones" and is an ORIGINAL1964 UKMONO 1st Pressing on the 1st PressUNBOXED 'Grooved' Decca label!!! !THIS LP IS SERIOUSLY RARE AND VIRTUALLY IMPOSSIBLE TO FIND!!!! THIS WAS THE ROLLING STONES FIRST & RARESTLP EVER - AND VIRTUALLY NEVER TURNS UP FOR SALE!!!! JUST TRY AND FIND ANOTHER ONE!!!! THIS IS ONE OF THE MOST SOUGHT AFTER LPs ON THE DECCA LABEL - AND IS INCREDIBLY TOUGH TO LOCATE TODAY!!!! BUT WHAT MAKES THIS LP REALLY SPECIAL, IS THAT IT IS THE ALL TIME RAREST 1ST PRESSING OF THIS LP EVER MADE - WITH A COMPLETELY DIFFERENT MIX THAT ONLY EVER HAPPENED ON A TINY HANDFUL OF THE 'EARLIEST' 1ST PRESSINGS ONLY!!!! AND THIS IS ALMOST IMPOSSIBLE TO FIND ON THIS LP!!!! THIS IS THE AMAZINGLY RARE '2.52' MONO 1ST PRESSING OF THIS LP AND PLAYS THE WITHDRAWN '2.52' VERSION OF 'TELL ME'!!! !THIS '2.52' MIX SHOULD NEVER HAVE BEEN ON THIS LP AT ALL (IT WAS SUPPOSED TO HAVE BEEN A DEMO VERSION ONLY! ), ANDWAS IMMEDIATELY CHANGED TO THE STANDARD '4.06' PRESSING OF 'TELL ME' WHICH APPEARS ON ALLLATER PRESSINGS!!! !ONLY A TINY HANDFUL OF THESE LPs LEAKED OUT WITH THE '2.52' VERSION BY MISTAKE - AND MAKES THIS, THE RAREST ROLLING STONES LP OF ALL TIME!!!! IT IS ALSO VERY IMPORTANT TO NOTE THAT ON THIS 1ST PRESSING - THE '2.52' VERSION OF 'TELL ME' IS NOT ONLY SHORTER THAN THE STANDARD LATER '4.06' VERSION - BUT ALSO ATOTALLY DIFFERENT RECORDING!!!! IT SOUNDS TOTALLY DIFFERENT (AND IN MY OPINION BETTER AND CERTAINLY FAR MORE INTERESTING!) AND IS A SUPERB EXAMPLE OF THE ROLLING STONES AT THEIR VERY BEST!!! !SO THERE IS ABSOLUTELY NO DOUBT AT ALL, THAT THIS IS THE 'EARLIEST' & RAREST 1ST PRESSING OF THIS INCREDIBLE LP THAT YOU CAN POSSIBLY GET!!!! BUT THERE IS 1 MORE VITALLY IMPORTANT DETAIL - THAT MAKES THIS THE ALL TIME 'EARLIEST' & RAREST '2.52' 1ST PRESSING EVER MADE!!!! AND IT IS SOMETHING THAT MOST '2.52' 1ST PRESSINGS SIMPLY DO NOT HAVE!!!! AND THAT IS THAT THIS LP HAS THE ALL TIME'EARLIEST POSSIBLE' 1ST PRESS 1A/1A MATRIXES - WHICH MAKES THIS LP QUITE LITERALLY THE 'EARLIEST' 1ST PRESSING YOU CAN POSSIBLY GET!!!!! AND THE WORD 'RARE' DOESNT EVEN BEGIN TO DESCRIBE THIS LP WITH THESE MATRIXES!!!! I HAVE ONLY EVER HAD 10 OF THESE '2.52' 1ST PRESSINGS EVERBEFORE IN MY VERY LONG TIME IN COLLECTING & SELLING RECORDS (THEY ARE ALMOST IMPOSSIBLE TO LOCATE!) - AND 5 OF THESE WERE 1A/2As (THE MOST COMMON), AND 2 HAD 2A/2A MATRIXES. BUT THIS IS ONLY THE THIRD TIME EVER - THAT I HAVE FOUND THIS LP WITH ULTRA RARE 1A/1A MATRIXES!!!! IN FACT, UP UNTIL QUITE RECENTLY - MOST PEOPLE I HAD SPOKEN TO WERE UNDER THE IMPRESSION THAT 1A/1As DIDNT EVEN EXIST!!!! BUT HERE IT IS!!!! AN ABSOLUTELY 100% GENIUNE 'EARLIEST POSSIBLE' 1ST PRESSING OF THIS LP WITH 1A/1A MATRIXES AND A COMPLETELY DIFFERENT VERSION OF 'TELL ME'!!!! THISLP IS OF THE UTMOST RARITY - ANDALMOST IMPOSSIBLE TO FIND LIKE THIS, AND I AM VERY CERTAIN THAT IT WILL BE A VERY VERY LONG TIME (IF EVER!) BEFORE YOU GET THE CHANCE TO OWN THE 'EARLIEST' & RAREST '2.52' 1ST PRESSING OF THIS LP AGAIN!!!! THIS LP ALSO HAS THE 'EARLIEST' 1ST PRESS 'MONA' COVER TOO - WITH MANY MISPRINTS & ERRORS ON THE COVER BACK (AND THE WRONG 'MONA' CREDIT! ), WHICH AGAIN, ALL LATER PRESSINGS NEVER HAD!!!! NOT ONLY THAT BUT THIS LP IS IN BRILLIANT CONDITION - AND IS VERY HARD TO FIND LIKE THIS NOW!!!! AND THE ALL IMPORTANT WITHDRAWN '2.52' VERSION OF 'TELL ME' PLAYS ABSOLUTELY SUPERBLY!!!! I JUST PLAYED IT RIGHT NOW - AND DIDNT EVEN HEAR 1 TINY CLICK!!!! EVEN THE ULTRA RARE 'MONA' COVER IS IN BRILLIANT CONDITION TOO - AS MY PICTURES CLEARLY SHOW!!!! JUST TAKE A LOOK AT THE PICTURES!!!! THIS IS THE ORIGINAL 1964 UK 'EARLIEST' MONO '2.52' 1ST PRESSING ON THE 'EARLIEST' 1ST PRESS UNBOXED 'GROOVED' DECCA LABEL, 'EARLIEST EVER' 1ST PRESS 1A/1A MATRIX ENDINGS (INDICATING THE WRONG '2.52' VERSION OF 'TELL ME'! ), 'EARLIEST' 1ST PRESSING 'HANDLING/PLAYING' INNER SLEEVE, AND 'EARLIEST' 1ST PRESS 'MacNEILL' FLIPBACK LAMINATED 'MONA' COVER!!!! THIS LP IS SERIOUSLY RARE AND VIRTUALLY IMPOSSIBLE TO FIND LIKE THIS- SO DONT MISS OUT ON THIS AMAZING OPPORTUNITY!!!! This is the ORIGINALDecca UK'2.52' 1st Pressing from 1964 and is in BRILLIANT condition!!!! The record is pressed on THICK quality vinyl. The Cat. No is LK 4605on the ORIGINAL1st Press UNBOXED 'Grooved' Decca Label (see picture) and is aUK MONO 1st Pressing!!!! The record labels are in BRILLIANT condition (see pictures) with NO annotations, NO ink marks, NO writing, NO stickers, NO wear (apart from the absolute TINIEST touches to the centre holes ONLY! ), and some spindle markings on either label!!!! And even though this LP has been played a few times - it would have ONLY been on a VERY high quality system, as this LP plays BRILLIANTLY!!!! The vinyl is in BRILLIANT condition!!!! Most of these 60s LPs had been to a lot of wild parties and are usually found totally worn out, and almost unplayable. This one is NOT and has NO nasty deep feelable scratches AT ALL, NO nasty concentric marks, only a few MEGA light hairlines (only visible under VERY bright light! ),only 2 or 3 VERY light scufflines (NON sounding! ), only 2 or 3 TINY surface marks, andonly a VERY few of the lightest paper scuffs only visible underlight!!! !THE RECORD STILL RETAINS ITS ORIGINAL JUST PRESSED LOOK AND SHINES LIKE NEW!!!! It is also GREAT to find that the record plays as STUNNINGLYasthe visual!!!! Therecord plays with NO skips, barely ANY clicks AT ALL, NO sticking, NO jumps, and barely ANY crackle AT ALL!!!! And the ALL IMPORTANT track 'Tell Me' plays SUPERBLY - with NO clicks, and sounds BRILLIANT (I played this LP end to end just now!)!!!! The record must grade Very Good+ if not better - and is a very VERY decent example indeed!!!! Believe me this record is NOT overgraded in ANY way!!!! I use STRICT RC grading standards - it is not in my interest not to!!!! Brillant!!!! The record comes in its ORIGINAL 1st Press'Handling/Playing' inner sleeve which is in BRILLIANT condition!!! !The ORIGINAL & 'Earliest' 1st Press 'MacNeill' Flipback Laminated 'Mona' Cover is in BRILLIANT condition!!!! The cover has NO edge wear, NO spinal wear, only VERY slight corner wear (NOT through the colour! ), only a few VERYlight creases(cover is VERY flat looking indeed! ), VERY shiny laminate, NO splits, NO annotations, and NO writing!!!! The opening edge isbeautifully straight with barely ANY feathering AT ALL!!!! Even the unlaminated back of the coveris in BRILLIANT condition with NO yellowing, NO grubbyness, only the TINIEST touch of wear to the EXTREME top right flipback corner ONLY, NO ringwear, NO rubbing, SUPERB vivid unrubbed black print, andNO writing!!!! Thecover must gradeVery Good++ if not better!!!! BRILLIANT COVER!!!! THIS LP IS SERIOUSLY RARE AND VIRTUALLY IMPOSSIBLE TO FIND LIKE THIS (ESPECIALLY AS THE 'EARLIEST' 1ST PRESSING EVER MADE - WITH 1A/1A MATRIX ENDINGS, 'MONA' COVER & THE WITHDRAWN '2.52' MIX OF 'TELL ME'!) - SO DONT MISS OUT ON THIS INCREDIBLE OPPORTUNITY!!!! HAVE A LOOK AT MY PICTURES - I DO MY BEST TO SHOW THE RECORD FROM ALL ANGLES AND MAKE THE PICTURES AS CLEAR AS POSSIBLE - THERE IS NOTHING TO HIDE!!!! It really is a GREAT looking LP and it is truly rare to find any copies of this MEGA RARE LP!!!! 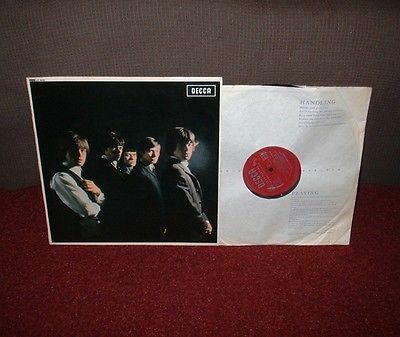 THIS WILL BE YOUR ONLY CHANCE TO BUY AN ORIGINAL 1964 UK'2.52' MONO 'EARLIEST' 1ST PRESSING OF "THE ROLLING STONES" BY THE ROLLING STONES, IN BRILLIANT CONDITION!!!! Dontforgetto take a look at allmy other items including many other TOP LPs and contact me with any queries you may have. Postal discounts for multiple buys are always available - and I guarantee to ALWAYS undercharge on postage! Paypal, Bank Transfers, Cheques, International Money Orders, and Postal Orders accepted. Thanks for looking! Cheers!!!!! Though there are rarely ever any problems with my items (I always try my very best to describe everything exactly!) - PLEASE REMEMBER to contact with me FIRST, if you have any problems at all, before you leave feedback and star ratings, so I get a chance to turn any negative experience into a positive one! I can always happily sort anything out for you, if you let me know you have a problem! This way no one hasto leaveNegative/Neutral feedback - and we both walk away happy! Please do NOT bid if you cannot give me at least 1 chance to sort everything out to your FULL satisfaction in the unlikely event of a problem.Thanks again - Graham @ XXXRecords. PLEASE NOTE - Private feedback bidders must consult me first prior to bidding - due to previous problems regarding non-payment, and non-receipt. MY POSTAGE UNDERCHARGE GUARANTEE TO ALL BUYERS (I always undercharge on postage! ):- Due to UK Royal Mail's obscene price increases this year - I have had no choice but to increase postage charges a little. Until this year - I had kept them exactly the same since I joined ebay back in 2002. However this years price increases have been so obscene, that I have had no choice but to increase my postage charges for the first time ever. However PLEASE NOTE - my absolute 100% guarantee to you as a buyer - is that I will ALWAYS undercharge postage on everything I send out. Even after the increases, I am still charging you the buyer LESS than I am being charged myself. On each package I send out - the price is clearly stated on the front of the package (please check it when you recieve it!). I also do NOT charge for packaging costs - ONLY for postal costs! And should you find that I have overcharged you postage in ANY way - I will refund DOUBLE the difference. THAT IS MY 100% POSTAL GUARANTEE FOR EACH AND EVERY BUYER! No buyer EVER deserves to be overcharged on postage - and on my listings, I'll make sure they are ALWAYS undercharged. Any questions - please ask!